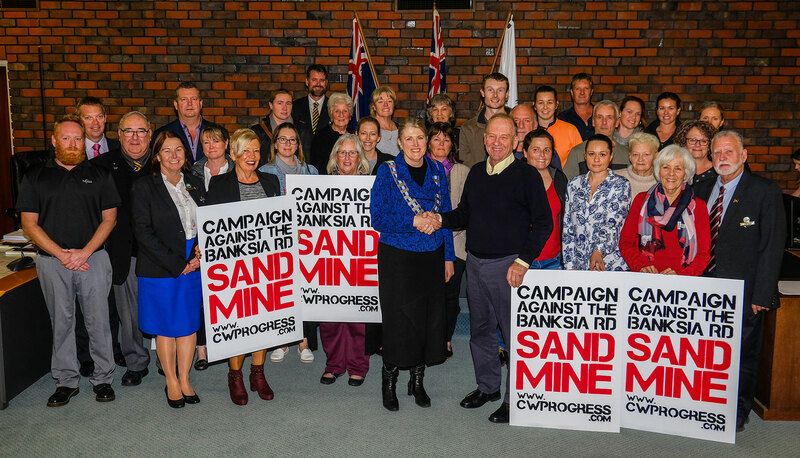 On the 8th August 2018 at an Ordinary Council Meeting, the City of Kwinana and Casuarina Wellard Progress Association (CWPA) entered in to a collaborative agreement to campaign against the proposed Banksia Road sand mine. This extraordinary motion was passed unanimously. Hanson Construction Materials Pty Ltd (previously ROCLA) gained approval from the Department of Mines and Petroleum (DMP) to commence the development and operation of the sand mining project from Lots 53 and 1320, Banksia Road, Wellard on 11 April 2016. The City was not informed of this most recent proposal and had a number of adjacent local residents have informed the City that they were also not consulted. Sand mining at this site has been opposed by the City for over 10 years. Hanson Construction is now seeking to clear 16.25ha of very good to excellent condition Banksia Woodland, now listed as Endangered under the Environment Protection and Biodiversity Conservation Act 1999 (EPBC Act). City Officers have reviewed the Preliminary Documentation available as part of the Public Notice and have prepared a submission to the Commonwealth Government strongly opposing the clearing of native vegetation for the purposes of the mining operation for Council’s consideration (refer to Attachment A). Endorses the submission contained within Attachment A which contains the City’s comments on the Publication of Preliminary Documentation under the EPBC Act, as per the Public Notice dated 27 July 2018. Write to the Western Australian Minister for Environment requesting that they refer the matter to the EPA under section 38(4) given the community has demonstrated significant concern with the proposal (Attachment B). Write to the Western Australian Minister for Mines requesting that the matter be referred to the EPA under section 48i and 38(5) of the Environmental Protection Act 1986, for assessment given that new information is available indicating the proposal will impact the Threatened Ecological Community “Banksia Woodlands of the Swan Coastal Plain” (Attachment C). Write to the Federal Minister of Environment requesting that the matter be referred to the EPA under section 48i and 38(5) of the Environmental Protection Act 1986, for assessment given that new information is available indicating the proposal will impact the Threatened Ecological Community “Banksia Woodlands of the Swan Coastal Plain” (Attachment C). affected residents to stop the sand mining proposal and clearing of vegetation at Lots 53 and 1320 Banksia Road, Wellard. Authorise the City Officers to work collaboratively with the Casuarina Wellard Progress Association to give effect to the Council resolution. City enters in to collaborative agreement with the CWPA to Stop the Banksia Road Sand Mines.